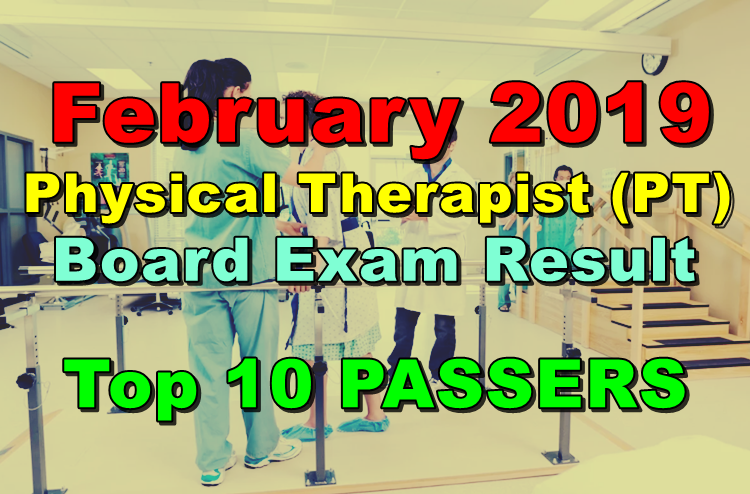 Here is the Physical Therapist Board Exam Result February 2019 released by the Professional Regulation Commission (PRC). The list of passers, top 10 passers, top performing and performance of schools for the Physical Therapist board exam result will be available on this website after it was officially released. The Physical Therapist licensure examinations were held at PRC testing centers in Manila and Cebu on February 3 and 4, 2019. Physical Therapy, Applications Electrotheraphy, Therapeutic Exercises, Principles of Rehabilitation and Hydrotherapy (45%). The PT board exam result is usually released within three (3) working days after the last day of examinations.